My Hunny borrowed some gardening tools from friend Heather's hunny. Notice how my Hunny is always capitalized, but no one else's hunny ever is? Yeah. Don't ask. While we're there, returning the wheelbarrow and post hole digger (that gate that's been lying on the ground for two years is finally fixed - yay hunnies! 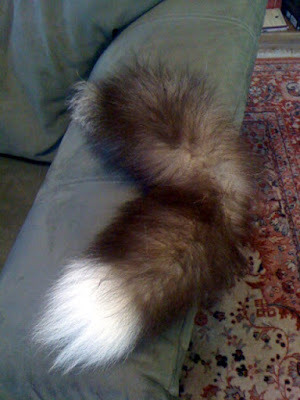 ), friend's hunny gave me a fox tail. 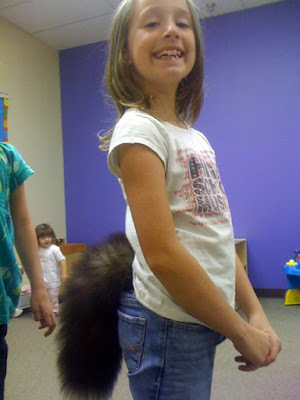 A real fox tail. Said he got it at a yard sale, but it scared their cats. He thought my dogs might like it. Oh. They did. Or one of them did. But! Before we get to the fox and the hound - er, Aussie - I took the tail to work last week. One of my foxier children tried it on for size. Back to the Babies - I got the tail home and Flash didn't look twice at it, but Patches sniffed it for five solid minutes. Then deserted it. Well good. It's a pretty thing. And soft. The little kids at work took to petting it. See it? I handed it to Patches one evening this week to see what she'd do. She took it in her mouth and tossed it around gingerly, cute as could be. I loves her. Then she settled down, just out of sight, and had her way with the fox tail. I'll never learn. You just can't trust dogs and children when they're out of sight and quiet. My dogs do the same thing. Drives me completely nuts. Any new toy I get them is demolished in minutes, therefore I get them no toys. Can't trust 'em when they're noisy...or sleeping...or..well, ever. They are out to dominate the world, and unfortunately, we are foiling their evil plans. 'Nuff said. Dogs and kids -- pretty much the same kind of creature. I say a young couple should be required to raise a largish dog for several years. IF they can pass that test MAYBE they are ready to be parents. And dogs don't require car seats, video games or parent-teacher conferences. 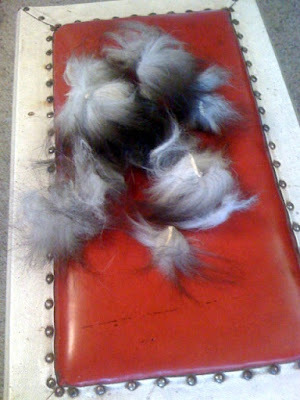 So sorry about that beautiful fox tail.